The end of another astrophotography season has come and passed. I managed to shoot two more targets on the last night of astronomical darkness of the 2012-2013 imaging season. The moon-lit astronomical darkness lasted for a whopping 14 minutes, the next few dark minutes are due in late August. The moon was at 70% full, but as most of the snow had melted the sky bacground brightness was pretty OK, it stayed level for about an hour on both side of proper midnight. 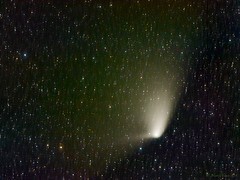 The comet C/2011 L4 PANSTARRS has moved way up north. It was roughly half way up between Shedir and Caph (the two "right-most" stars in Cassiopeia's W-shape). Due to it's northern position and the poor visibility north, I was able to image this only for half an hour in the waxing twilight before the comet was obscured by trees. With an hour or two more I might have been able to get a bit better stars on the background as the comet would have moved further during the stack. LRGB 9x 1 minute per channel, double stacked (comet + stars). 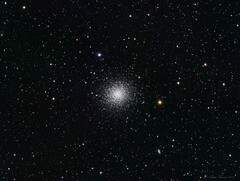 The very last deep sky image on the 2012-2013 astrophotography season was the Messie 13, a large globular cluster in Hercules. The image is stacked from six 5 minute exposures with LRGB filters. This does kill a bit of the interesting bits in the center, but brings out a lot of background galaxies.